Students representing the School of Social Work at The University of Southern Mississippi will conduct a research study on March 21 and 28 visiting residences in Hancock, Harrison and Jackson Counties. The data collected will be used for a research study on the adaptation and resilience of Mississippi Gulf Coast residents with regard to psychological implications of different hazards, such as Hurricane Katrina and the Deepwater Horizon oil disaster. For questions, contact Dr. Bret Blackmon at 228.214.3275. Hopefully, the Biloxi Lighthouse will be ready for touring again by next spring. Restoration work is set to begin in May and is slated to be finished by the end of the year. Hurricane Katrina washed out part of the brick interior and completely destroyed the electrical system. Built in 1848 as a "working lighthouse," the 61-foot cast-iron tower has long been a draw for tourists and locals alike (partly because of the spectacular view from the top). Along with restoring the lighthouse itself, there are plans to build a new visitor's center on the north side of U.S. 90 directly across from the tower. Housing remains the most critical issue facing Mississippi, according to a progress report Gov. Haley Barbour released Aug. 29 (on the third anniversary of Hurricane Katrina). 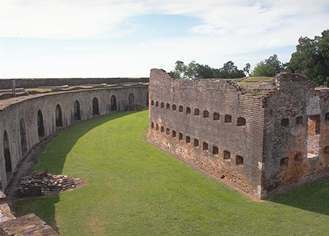 Fort Pike State Historic Site is open to the public once again. It is the last property operated by the Louisiana Office of State Parks to be reopened after Hurricane Katrina caused massive damage in 2005. In 1972 it was listed on the National Register of Historic Places. Long Beach arborist Rob Crawford told Kat Bergeron of The Sun Herald "we're not going to see many large trees in the future if we don't take care of them." The Sand Beach Authority is using grant money to try and improve the soil. Fulgham brings his patented mobile subterranean aerator to the job. His machine injects "forest floor extract" into the soil with a pipe into the ground, which creates a "soil wave" to break up compacted ground. New Orleans' first bicycle lane opened recently, taking riders through neighborhoods scarred by Hurricane Katrina - but also representing the progressive thinking hoping to bring people back to hard-hit areas. The three-mile bike path winds along St. Claude Avenue, through the Lower 9th Ward and to the St. Bernard Parish line. The lane added $93,000 to the cost of a refinancing project and was paid for with state and federal funds. They hope to boast 50 miles of dedicated or shared bike lanes in the city within the next five years. 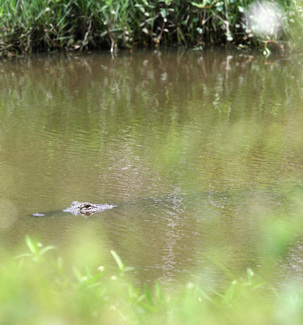 Hurricane Katrina deposited four alligators in Beauvoir's Oyster Bayou. But now that the grounds are open weekdays for limited tours again, the gators must go. It is currently undergoing restoration and will reopen fully in June. Richard Forte Sr., who heads Beauvoir and its board of directors, named the largest gator Beauregard after P.G.T. Beauregard, a snooty general who always questioned Jefferson Davis' authority. (Beauvoir is the last home of Jeff Davis.) The second largest alligator is Beau Jr. The Federal Emergency Management Agency on Feb. 22 agreed to requests from hurricane victims to test government-provided housing for dangerous levels of formaldehyde. FEMA has contracted with Bureau Veritas to test 200 travel trailers and mobile homes each week. The first tests began this week. Testing in Louisiana trailers found elevated levels of formaldehyde (some up to five times higher than normal). Since the findings were announced on Feb. 14, FEMA said 334 occupants have requested testing - and their trailers will be tested first. About 38,000 FEMA trailers and mobile homes still house hurricane victims in Mississippi and Louisiana. Residents of FEMA emergency housing in New York, Pennsylvania, Florida, New Mexico, Arkansas, Missouri, Oklahoma, Kansas and Minnesota will also be eligible for the test. If you want your unit tested, call FEMA's Formaldehyde Call Center at 1-866-562-2381. It took Hurricane Katrina for valuable paintings of the late Romolo Roberti to be taken out of the closet and put on public display at the Robert Henry Adams Fine Art Gallery in Chicago. Roberti worked in the maintenance department at Cornell University. 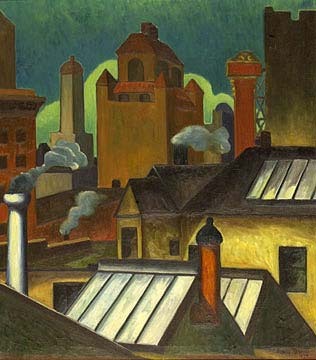 He eventually moved to Chicago and enrolled in the Art Institute of Chicago for formal training. The exhibit of works is on display until Jan. 8, 2008. It includes a 52-page catalog outlining his work. There are 36 works included in the exhibit.